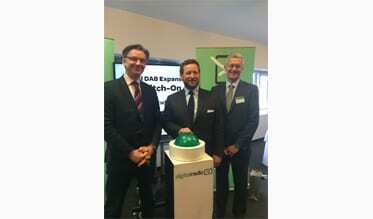 On Thursday 26 March, Ed Vaizey MP, Minister for Culture and the Digital Economy, officially switched on the new local DAB expansion programme at SMMTConnected, a major car conference hosted by the Society of Motor Manufacturers and Traders at the QEII Centre in London. The official start of this major programme of work to build out coverage of local DAB stations includes 182 new transmitters which will extend coverage of local DAB stations to more than 90% of the population, and add over 4,100 miles of roads into coverage, benefitting drivers as well as listeners at home. Over 50 local areas will benefit from new transmitters and the work will complete towards the end of 2016. A total of 182 new local transmitters are being built by Arqiva, the communications infrastructure and media services company, plus modifications at a further 49 sites, making local stations available on DAB to an additional 8 million listeners and drivers across the UK for the first time. This buildout is being jointly funded by Government, the BBC and the commercial multiplex operators. When this programme of work is complete, the switchover coverage criteria will have been met. This first switch-on means that 115,000 listeners and drivers in the Coventry area will be able to receive 5 local radio stations; BBC Radio Coventry and Warwickshire, Capital, Free Radio Coventry, Free 80s, Heart West Midlands, and Panjab Radio for the first time on DAB digital radio. The new transmitters at Ilmington, Shilton and Daventry give local digital radio stations on DAB to over 115,000 new listeners in the area, and add over 120km of roads into DAB coverage. An additional transmitter at Hartshill Quarry will be switched on towards the end of the year, improving coverage even further. The BBC is building 162 new digital radio transmitters to improve national DAB coverage for its national network stations. This work is already halfway through, and will improve coverage of BBC national network stations from 94% to 97% by the end of this year. This BBC national buildout includes a new DAB transmitter in Coventry city centre, which was launched in March 2015. The big switch-on took place at the SMMTConnected conference held at the QEII Centre in Central London. At the conference BBC Radio 4 presenter Justin Webb interviewed Minister Ed Vaizey, and the Minister stated that this programme of work showed the confidence that the broadcasters and Government had in DAB as a vital part of digital radio's future. Ed Vaizey, Minister for Culture and the Digital Economy, said: "Digital radio is the future of radio in the UK and I am delighted that Government has been able to play its part in this major expansion which will help accelerate the transition to digital radio, in the car and at home." Ford Ennals, CEO of Digital Radio UK, said: "We welcome the UK expansion of digital radio - it's great news for listeners as it means that millions more listeners and thousands more miles of roads will be able to receive DAB loud and clear." Chris Heaton-Harris, MP for Daventry said: "I'm really pleased that the new DAB transmitter means that our excellent local radio stations can now be received on digital radio at home and in the car. Local radio plays an important role in our community and often it is the best way to keep in touch with breaking news in the region." Mike Hawes, CEO of SMMT, said: "The SMMT welcomes this expansion of local DAB transmitters which will benefit drivers with digital radio across the UK." Paul Eaton, Director of Digital Radio of Arqiva said: "We are committed to extending digital coverage through local transmitters across the UK and this switch-on, which gives 8 million listeners access to our stations on DAB, is another important step for our industry."